Plummer, Kevin. "Toronto Feature: Tom Longboat". The Canadian Encyclopedia, 29 May 2018, Historica Canada. 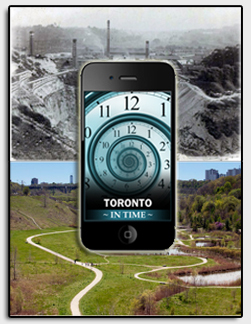 https://www.thecanadianencyclopedia.ca/en/article/toronto-feature-tom-longboat. Accessed 23 April 2019. Tom Longboat with his marathon trophies, c 1907 (courtesy Library and Archives Canada/C-014090). 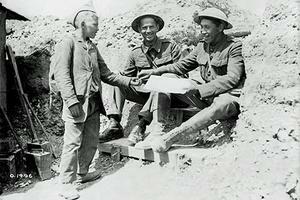 Private Tom Longboat buying a paper from a French newspaper boy, c 1917 (courtesy Library and Archives Canada/PA-001479). Longboat was one of the most celebrated athletes in the pre-WW I era (courtesy Canada's Sports Hall of Fame). 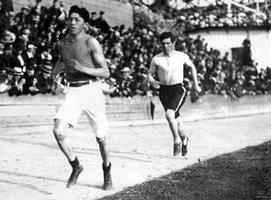 Tom Longboat was a superstar during the pre-First World War craze for long-distance running. The famous runner was born in humble origins at Ohsweken, on the Six Nations Reserve near Brantford, but based himself in Toronto for most of his racing career. He lived at the Grand Central Hotel owned by his manager, Tom J. Flanagan at 57 Simcoe Street. As an amateur, Longboat was nearly unbeatable. At the 1907 Boston Marathon, he beat the previous best time by nearly five minutes. In Toronto, large crowds gathered to receive telegraphed updates on his competitions elsewhere, and his victories were celebrated by mass jubilation at city hall. Tired of the strict amateur athletic code and surviving off whatever pocket money Flanagan might provide, Longboat turned professional and was soon earning an astronomical $17 000 per year. But Longboat had no input into when or where or how frequently his manager entered him in races, even when he suffered nagging injuries. Angry that Longboat ignored his patronizing guidance, Flanagan accused his star of laziness and insubordination. Reporters parroted the accusations, which fit established racist stereotypes about Aboriginals, without seeking the runner's opinion. "He has all the waywardness and lack of responsibility of his race," one paper editorialized. Another suggested he be treated more as a thoroughbred than an intelligent young athlete. On the eve of a big race Flanagan did exactly that, selling his contract with Longboat for a quick profit. Longboat protested that "he sold me like a racehorse," but found few reporters sympathetic to his side of the story.